They’re not effectively promoting their blog posts to drive eyeballs to them, meaning they are getting far fewer readers of their content than they could be… so the ability of their writing to impact the perception of their firm as a Subject Matter Expert or Thought Leader is dramatically weakened. Even if they send a “nice meeting you” follow-up email to everyone they met at a conference, that’s usually where it stops. What they’re not doing is consistently staying in touch over time. Buying decisions in our industry take a while… and if they don’t stay in touch (to stay top-of-mind), they won’t be thought of when the prospective client is ready to buy. They’re not tracking the metrics (which are available at the click of a button). Which means they’re not learning what kind of subject lines get the best ‘open rates’ or what kind of content gets the most ‘click-thrus.’ So, they have no idea if their email efforts are working or not… they just keep on sending them out (and keeping their fingers crossed). They’re not engaging with all that LinkedIn has to offer. They’re not proactively reaching out to connect with others, they’re not commenting on or ‘liking’ other’s posts and they’re not posting or publishing their own content… all of which means they’re not building relationships or building a reputation with the LinkedIn community. Opportunity lost. They run one ad – not a campaign – trying to raise the level of awareness of their firm, but it’s a campaign’s multiple impressions over time that can actually impact awareness. They focus their marketing & sales on acquiring new clients but spend very little effort on retaining existing ones. And it’s repeat clients that are necessary for long-term success. They create a sales & marketing plan that ends up just sitting on the shelf, instead of being the day-to-day guide for revenue growth. The point is this… wherever you are now with your marketing & sales program, consider yourself off to a good start! 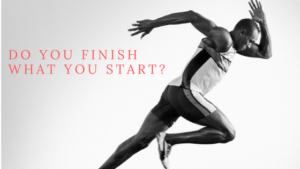 But to achieve a significant level of success, you must complete your journey… you must finish what you start.